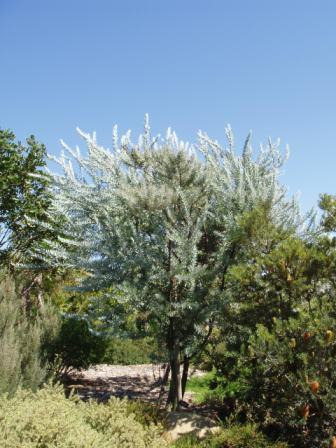 A fast growing, ornamental variable shrub or small tree with small white-grey leaves, chocolate brown branches and bright yellow globular flowers in winter-spring. Prefers full sun or partial shade and well-drained soils. Grows mainly on limestone slopes and ridges in NSW. Frost tolerant. Excellent windbreak or screen.